Using the moniker "Charlie the Clown", I wrote the beloved Rumors column for the various incarnations of Access magazine. Much to the consternation of some of the folks at Wang Labs -- and some people at Database Publications -- Charlie was the most popular feature in the magazine. Here's a typical example from July 1987. My Brother's keeper: Last month, Charlie said Wang was selling 833 LapTops a month. What he forgot to mention was that Wang guaranteed Brother (maker of the LapTop) sales of 1,667 units a month. In other words, Wang is selling less than half their commitment. Apparently, Wang has to buy the machines from Brother regardless of whether or not they sell them. This could mean some very good buys. Can Wang PIC up the PACE? Everybody's talking about distributed databases -- even Wang. Word is there will eventually be a distributed version of PACE. The only time frame: "Sometime in 1988." Wang OFFICE 2.05: The next general release of this product is due in the fall. Enhancements include network-wide calendaring and scheduling, a better PC interface and improved file transfer capabilities between the PC and VS. It will also support XMODEM transfers. Desperately seeking alternatives: Wang has put renewed vigor in the OIS product line (see OIS BASIC REMarks, page 30). But there are thousands of OISs out there that were acquired in 1982 on a five-year lease. This is 1987 -- those leases are ending. Word has it that people are looking everywhere for alternatives. Non-Wang PCs are a viable option, but there's the problem of hooking them together. So instead of creating an OIS capable of handling more users and potentially harming VS sales, Wang has decided to offer improved price/performance on their reworked OIS line (see Business Briefs, page 8). Sign on the dotted line: There's an interesting rumor that Wang is getting ready to ink a deal with publishing giant Interleaf. Truth or vile gossip? There's a vicious rumor floating around that Wang is on the verge of signing a licensing agreement for some of their own "undocumented third-party software." Gee WIIS: Contrary to rumor, WIIS (Wang Image Information System) is not a "PIC on a stick" or just a reworked document scanner. It's a very complex product that Wang (and the rest of us) want desperately to succeed. Just one question: Why hadn't some major potential customers (banks, insurance and government agencies, etc.) been briefed on this four-years-in-development product by the release date? The VS 1000/7320? Back in January 1986 (ACCESS, page 56), Charlie mentioned that Wang was slow at work on a VS 1000. This machine was to support 500 plus users. But last month's rumors left some folks confused. Is the VS 7320 going to support 512 users? Is the VS 1000 the same as the 7320? Charlie thinks not. The VS 1000 is/was a single processor -- not a dual processor. Adding to the confusion are Charlie's comments about the 7320 supporting 512 tasks, but only 256 workstations. One friend was told there would be 512 ports; another was told there be support for 512 workstations. Someone on the periphery of the 7320 development could only cryptically say, "It's a big mess." (Charlie thinks he was talking about the 7320, but he could have been talking about his desk.) But a final source says the 7320 Operating System isn't working: "Sort of like the good old days of the VS 300." Mac attack: There are a lot of Apple Macintosh computers out there that would dearly love to be connected to the Wang VS. Wang has a Macintosh-to-Wang board, but they're not sure if they should release it. We say "Do it!" Quote of the month: This month it's a toss-up. "The Advent workstation is not in competition with the Sun and Apollo. It's simply addressing specific incremental needs of VS users who aren't using Sun or Apollo in their organizations." Or, "Wang's getting excited about UNIX again and that's a bad sign." Terminal abatement: Just as Wang is rolling out the new PCs (see News, page 10), Charlie is hearing massive rumblings about the original Wang Professional Computer. Folks are very unhappy about its shortcomings. Says one end-user with 500 PCs, "I want to add EGA monitors, extended memory cards, internal modems, 80386 add-in boards and other AT-compatible cards to my PCs and run software that takes advantage of all these add-ons. My Wang salesman says if we want those types of enhancements, we should buy the PC 280. I'm going to tell my boss to buy 500 overpriced clones? Wrong, terminal breath. Then the salesman tells me I should buy the new Wang PC AT coprocessor board. I'm going to shell out $500,000? Wrong again. I'm very unhappy." 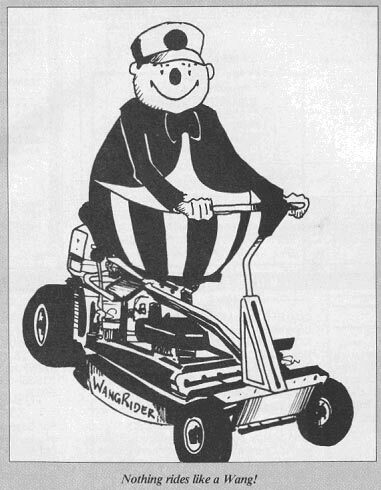 Just in time for summer: A flyer we recently received carried the following product announcement: "Wang Laboratories proudly announces the `seventh technology' -- digital lawnmowing -- via its introduction of the WangRider Digital Riding Lawnmower. This new product positions Wang Laboratories at the true leading edge of technology. Features: Homes to garage or storage shed via RETURN key; eliminates common lawn pests via EXECUTE key; protects operator's feet with Boot Operations; Cut & Feed Operations (concurrent lawn fertilization) provided via optional Feed-Only Memory; automatically collects cuttings via 16-bit parallel PUSH Operations into a high-capacity virtual storage Bit Bucket without `clipping'; multiple releases allow demand-emptying of the Bit Bucket via POP Operations; and low cost -- some Assembly Language required!"